Bill Effinger 1937 Wingspan 66"
The Standard Buccaneer is a simple and solid design with top turtle decking on the fuselage and an under cambered wing section. 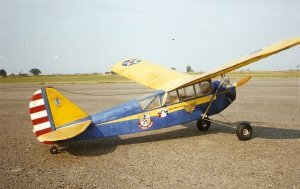 The model in the picture is Mike Whittard's original model bulit in the late 1970's and still flying today. It was converted to electric power in the 1980's using a 600 size can motor with a 3:1 reduction gearbox.